Glenn Irwin celebrates his podum finish at Donington Park. Glenn Irwin made an excellent start to the 2017 MCE British Superbike Championship at Donington Park on Sunday as the Carrick rider swooped late to seal a superb rostrum finish in race two. The PBM Be Wiser Ducati rider denied Ulster team Tyco BMW and Christian Iddon a second podium after he made a stunning pass on the final lap, before edging away to clinch his third career BSB rostrum. Irwin, who twice finished in the top three during his rookie season in the class in 2016 for Paul Bird’s team, had earlier finished a solid sixth in race one on a very encouraging day for the 27-year-old. His podium result gave the PBM team a boost after reigning champion Shane ‘Shakey’ Byrne was forced to sit out both races after he suffered concussion following a crash in morning warm-up at Craner Curves. Ulsterman Irwin, who has set himself a target of making it into the Showdown this year on the Panigale R, said: “After Shakey crashed someone said to me that the pressure was really on as I was carrying the hopes of the team, but while it’s not the ideal way to get an opportunity, I saw it as exactly that and took it with both hands. “I was able to manage the tyres really well in both races but in the first race I was a little bit cautious in making my move, so I made sure in the second I went for it. “I was able to make passes from a long way back but in a controlled way and the front tyre was so good it allowed me to do pretty much what I wanted,” he added. JG Speedfit Kawasaki’s Leon Haslam clinched a double, beating team-mate Luke Mossey in race one by more than five seconds, with Stockport rider Iddon third on the Tyco BMW. Peter Hickman (Smiths BMW) and James Ellison on the McAMS Yamaha were fourth and fifth respectively, with Irwin rounding out the top six. Michael Laverty (McAMS Yamaha) finished in eighth, one place behind 2015 champion Josh Brookes on the TAG Racing Yamaha. Laverty was forced out of race two after running into problems with his R1. 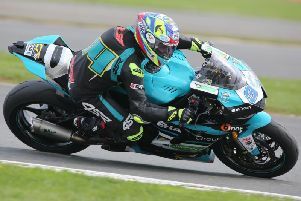 Iddon was denied another podium when Irwin pounced on the final lap for third, while Mossey and Ellison were the top six. Sylvain Guintoli, a faller in race one, finished seventh on the Bennetts Suzuki followed by Hickman and new Tyco BMW signing Davide Giugliano, who crossed the line in the first race in 13th place. Michael Dunlop, who is competing in the opening BSB rounds on his Bennetts Suzuki GSX-R1000R as preparation for the international road races, finished 16th and 17th respectively. The next round of the championship will take place over the Easter weekend from April 15-17 at Brands Hatch.